Detailed visit of the Alcazar Palace and Cathedral/Giralda. 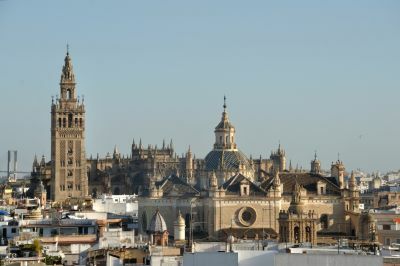 Seville is one of Spain´s major cities and is also the capital of the Andalusia region. It is full of narrow streets, small plazas and beautiful parks and gardens. Sevilla became a great city in Muslim times and became one of the wealthiest cities in Europe during the 16th century when it was an important trading post. On this full-day private shore excursion from Cadiz you will be taken on a guided walking tour of Sevilla´s most important monuments. Such as the Giralda Tower; at one time a minaret and today part of Sevilla´s cathedral; world´s biggest Gothic temple and the third largest Christian cathedral, the Real Alcazar; a fortified palace which later became the residence of various monarchs, and the Old Quarter. Museums and art centres, theme parks, cinemas, theatres and clubs are some of the many leisure options that a great city like Seville holds. Without forgetting, of course, the numerous terraces, inns and bars where visitors can practise one of the most deeply-rooted and tasty traditions in the city: "Going out for tapas". Tour will end at the recommended restaurant where we have booked you a table for lunch. Upon return to Cadiz take a quick panoramic tour of the city with your chauffeur.